Tarragon - very tasty refreshing drink. It is not surprising that many people like it. For some reason, used to buy it in stores, oblivious to the fact that tarragon can easily prepare at home. Tarragon is not only delicious but also very healthy drink. The fact that the herb tarragon, which is also called watermelon, is having on the human body a soothing, relaxing effect. It's so important in modern life filled with stress. If you cook the tarragon house, we can not worry about the genuineness and quality of the drink. You get a clean product is of great taste, which will help you not only to quench their thirst, but also help to protect your nervous system, have a restful sleep and, therefore, vivacity of spirit and good mood. It is worth noting that homemade tarragon is not only fully natural but also better able to quench your thirst than drink from the store. When purchasing tarragon, you may get the product, rich in various dyes and preservatives. In addition, the composition of some varieties of this drink may include sweeteners, which can adversely affect your kidneys. Tarragon contains large amounts of vitamins, including ascorbic acid, vitamins A, b, D, carotene and essential oils. Note that homemade tarragon has a bright acid green in color. It can be either yellow-green or dark green. All depends on the amount used of the herb tarragon and the time of infusion of the beverage. It is a pity that tarragon is not too often found in stores, although it is a very small price. The average cost of a small container of the treasured herb is about fifty roubles. If your city tarragon is not sold in stores, do not particularly upset. The fact that this plant can be grown in their own country or even just on the windowsill. The nice thing is that for homemade tarragon you don't need much grass, only one of the trays, of course, if you want to achieve more richness of taste and color, it is advisable to increase the amount of tarragon. In addition to herbs you'll need sparkling water. It can be purchased at the store or make your own using a siphon. - 2 cups of plain water. The process of creation of the tarragon at home begins with the preparation of sugar syrup. For this you need to melt seven tablespoons of sugar in two cups of water and slowly stir, bring to a boil. The syrup needs to boil for about two minutes, after which it is ready, you can leave it to cool and start preparing the herbs. Rinse tarragon and grind them. Of course, easier to do it with blender, however, if necessary you can do with a utility knife. 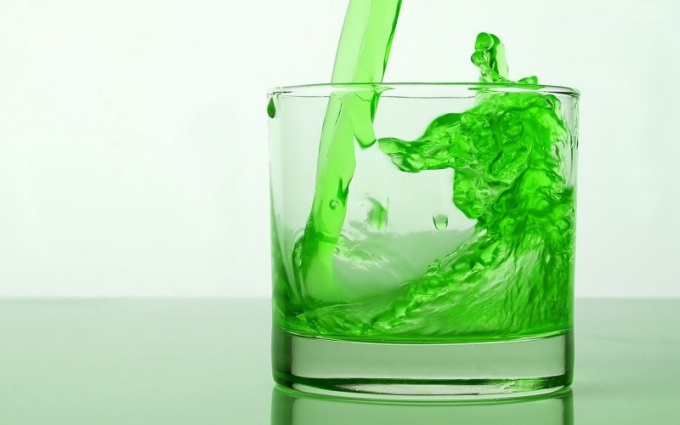 As a result, you will become aromatic green mass. Should hurry up a bit, because the chopped tarragon to time to add to the still hot sugar syrup. Then cover the container with a lid and leave to infuse. The longer the infusion process, the richer will your next drink. The minimum time is approximately one hour. After that, the future tarragon to drain. You can use a fine sieve or a gauze. Take your time, thoroughly squeeze out of the grass all the juice, because it has so many nutrients. The resulting sweet infusion, add carbonated water and lemon juice. That's all, homemade tarragon ready. Of course, chilled to drink it much nicer, so the drink should be placed for awhile in the fridge or you can just add a couple of ice cubes.